A dorm Christmas Tree and Mini Lights all in one Dorm essentials item! Now that you're in college, you want to do some dorm room decorating for the holidays. Your dorm room decorations for the holidays begin with your dorm Christmas tree. However, since you're on your own in college, maybe you don't want a traditional dorm Christmas tree like your parents may have at home. Maybe you want something a little different for your dorm room decor. 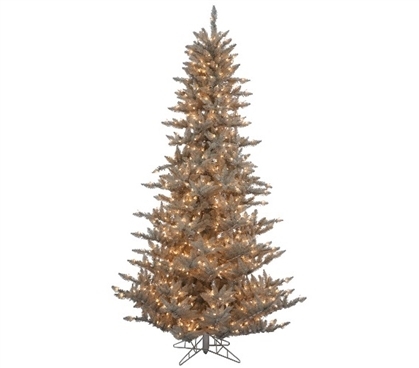 For great style in your college dorm room and a unique piece in your dorm room decor, add our Grey Fir Tree with Mini Lights. Our Grey Fir Tree has soft grey colored branches that will make your holiday dorm room decorations pop against the softly colored neutral backdrop. Wrapped around this dorm necessities item are clear dorm mini lights on grey wire so that you have part of your holiday dorm room decorating already finished for you! Once you add garland and some favorite ornaments from home, your holiday dorm room decorations will really start to take shape and make your dorm room decor look amazing. Plus this dorm necessities item is compact so you can have style for the holiday season without losing a lot of dorm room space.